Famous people born on March 26th are hilarious. When it comes to family relations, they value their ties with them. They realize what it takes to raise a child and will take great responsibility when their time arises to have one or two. March 26th born famous people might have loose lips. Sometimes, they just open their mouth and either something awful will come out or something really sweet. There’s no telling about what they will say. If you share your birthday with famous people born on March 26th, you will need a spouse. This, too, should not be a problem as you know how to treat a lady or a man. These celebrities will typically put them first. With this in mind and considering someone who is your opposite but complements you, the union could last for a life time. The Aries born today loves to cook and does a great job. It is the best way to bring the people they love together. 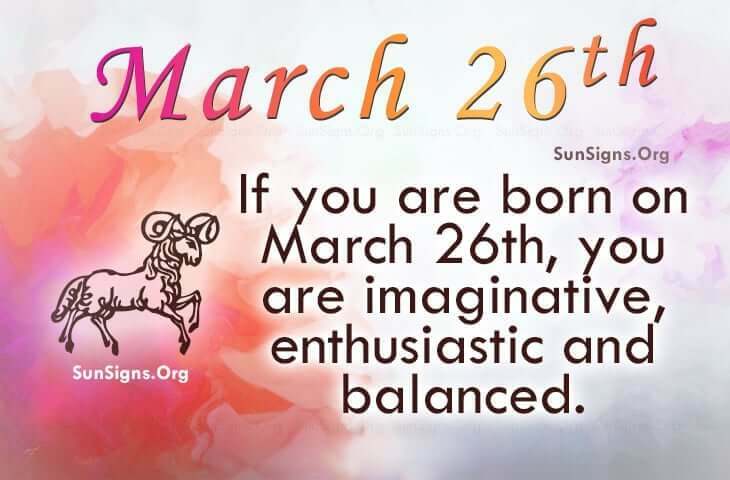 Famous people born on March 26 are Aries and are a joy to have around. Perhaps, they are dependent on others for love and security. On the other hand, they are not in a hurry to marry. Their health is generally good but could benefit from regular check-ups.